Discussion in 'Feline Health - (The Main Forum)' started by Jenn C + Henry, Jan 25, 2019. I am having trouble getting a good pinch of skin on my skinny long haired boy. Any tips on good locations or tricks? You could shave a small section under fur so you can see the skin. I pull up near the scruff, but actually separate the fur and ball it up into my hand so I can see the needle going into the skin to make sure I don't give a fur shot. Hi there, I have a long haired furrball also. This isn't what everyone does, but it works for us: first I part the fur so I can see a line of skin along the part, just like seeing your scalp along a length of a part in your hair. Then I pop the syringe in at/close to the beginning of the part, and push it away from me along the part line for about half an inch. Then I inject insulin. Then withdraw syringe. The feeling of pushing the syringe through the skin: learn this by practicing on a tomato, with water in the syringe. You dont have to change syringes every time you shoot the tomato at all. Just sit in comfy chair, shoot the tomato a lot, til you get the feeling of going through the tomato enough to inject the water. Then eat the tomato, salad dressing optional. I can see and feel what's going on a lot better this way than with the usual "tenting" methods. Read where on Kitty's body to do the shot. Anyway, this was how I was taught to do subcutaneous shots in med school. You will be able to see the needle move along under the part with some practice, for us anyway minimal risk of "fur shot." Keep at it, whichever way you prefer. Many people mention shaving an area on these long haired furballs too, seems a good idea to help see what's going on. We shave a little patch of fur on Benny's scruff. It doesn't even need to be shaved clean, just close enough that you can see to shoot. Yes, M'row is also a long-haired furrball. I part his hair so I can see right down to the skin for about 1/4 inch parting, stick the needle in (bevel up) until it's just through skin, then push it along just below skin for about 1/4 inch just below parting, then slowly inject. I don't do the tent thing myself. I think shaving sounds like a good idea. All that fur has to get out of there somehow! My kitty is skinny and long haired, and although she doesn't have much undercoat and is reasonably cooperative, I did have some issues with fur shots at first. While I know many folks like to inject while the cat is eating and distracted, I miss more that way. So once she's been eating for a few minutes, I generally pick her up and put her on the counter so she's at a comfortable height and I can see what I'm doing more easily. I part her fur somewhere approximately between her shoulder blades where she's got more loose skin, and while holding her fur parted, I pull up a tent of skin and shoot into the bare skin spot. She jumps down and goes back to eating once I let go of her. Take some fur between your thumb and forefinger and then "roll" your wrist to gently pull the skin up. Where the hair naturally parts, aim and shoot. You don't have to give the shot in the scruff. My cat is black. I part his fur in the Flank area till I see his white skin & inject the insulin at an angle just under the skin. ( you don't need to pinch his skin & have a lot of area to shoot. I did a fur shot when I tried to inject in the scruff,back when I first started. Since I switched to his side I've never done a fur shot in a year now. We all have our own techniques for shooting but just a few thoughts and others may bring some of their ideas in as well. You can shoot the scruff, side of chest, side of belly, side of flank....wherever your kitty is comfortable and you have the least chance of doing a fur shot. It's actually a great idea to rotate sites in order to prevent development of a lipoma or scar tissue. A lipoma is just a thickened area of fatty cells right under the skin. If you shoot in the same place repeatedly and your kitty develops one, they often will go away on their own if you switch to another site. However, if you change injection sites every day (if possible), there is a much decreased chance in developing either a lipoma or scar tissue. Both of these can affect absorption negatively. If your cat prefers scruff shots only, you can shoot one side in the morning and the other side at night; you can also move the scruff site so the first day, you shoot at the inner scruff on one side, the next day, the middle scruff, and the third day, the outer part of the scruff. 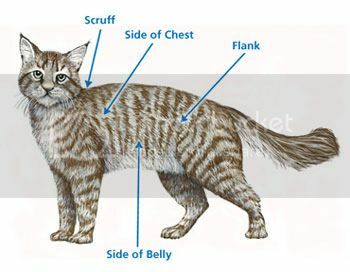 Or, if kitty is tolerant of any injection sites, you can shoot one side in the mornings and shoot the scruff the first day, the chest the next, the flank the third day. In the evenings, you can shoot the other side of the kitty but in the same order. Newbie here with a long haired cat. I created and printed a little chart with an outline of 2 cats for each day of the week that I put a little dot on to show me where I last injected. It helps me rotate spots. Some times he is too agitated and just shoot where he lets me. I fluff up the hair in that area so there is a part. I then grab the hair that is parted back and pull up a bit to get it away from the body. This may be the same as tenting, but he just doesn't have a lot of loose skin to give the full tent look. I then inject making sure I feel the resistance of skin. Then inject. I try to do it gently, but there has been at least once I was a bit more forceful than I liked as he tried to walk away when I was pushing and I didn't want it to come out and make him go through with it again. I'm actually glad he has long hair for me to pull. I think I'd have more trouble with a short smooth haired kitty. I get behind / on top of her and strongly blow her fur from an inch or two away, which creates a fur-free hole. It works fabulously. Just keep it spread open with your fingers after that. I tried to photograph or video this, but her fur is black and you can't see it.